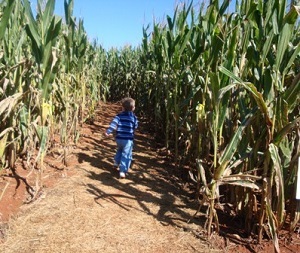 Looking for a local corn maze or hayride in Charlotte area of North Carolina? Scroll down this page and you will see the all of thoses in Charlotte area of North Carolina, sorted by county. Some are huge corn mazes with hayrides, pumpkins, corn cannons, inflatables and others are simple corn mazes with little else. Most also have loads of pumpkins to choose from. To really make it fun for your kids, look for those that have the extra activities, like a corn cannon, cow train, inflatables, farm animals, pumpkin patch or zip lines. There is usually a small fee for the mazes (of course, the more elaborate mazes tend to charge more. Hayrides are often free. ALWAYS call before you go to confirm the info, they don't always report changes to me! A visitor writes on October 10, 2013: " "Went every year with my daughter and son\'s Preschool class. Always had a great time!" 3718 Plyler Mill Rd., Monroe , NC, 28112. Phone: 704-709-7000. Email us at: bonnie@awshuckscornmaze.com. Directions: From Downtown Charlotte, NC: Click here for a Google Map Aw Shucks! is on the right after Griffith Road! Open: September 13th - November 23rd (in 2008); see this page for current dates, hours and prices. Payment: Cash, Credit cards. See above.. Old Fashioned General Store or enjoy a Hayride to the Pumkin Patch! Farm Animals! Aw Shucks! now has some adorable, visiting animals (click on Animal Barn for details). Bonfires! We now have a private setting for your group to enjoy a campfire atmosphere (ask about our "smore" kits in the General Store). Public Restrooms! Flashlight Nights open Wednesday Nights 6pm-8:30pm. Bring a Flashlight!! Our paths are cut wide and strollers and wagons are welcome. Maps are given to visitors to guide you through the maze and employees are in and out to verify on you. For an extra adventure, try the maze at NIGHT! (Bring a flashlight) Picnic Area: We have plenty of Picnic areas. Feel free to bring your own food. In our General Store you will find sodas, water, snacks, candy, popcorn, and lots of unique gifts!